What a wonderful read to pass all those hours away on two 12 hour flights one after the other. This is some of the finest non-fiction writing I have ever read. 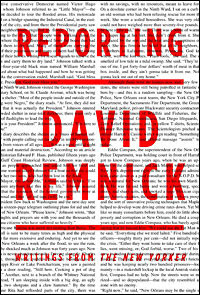 Remnick is Editor of The New Yorker and this is his fifth work of non-fiction. Reading it I am not at all surprised to learn that he is a Pulitzer Prize winner, (for one of his earlier titles, Lenin's Tomb). This book features some of Remick's finest columns from The New Yorker over the post 10 years and I cannot recommend it strongly enough. It is published by Vintage US and costs $30 in NZ.